Membership: Ideas were discussed regarding recruitment of new members. According to John Scheer, Greg Nagel is working on a welcome letter for all new EVA members. Rich Anselmo agreed to speak with a representative from Hoosier Mama Pie Co. regarding the possibility of donating pies for sampling at the next membership meeting as an incentive for existing and new members to come. Rich Anselmo also suggested the possiblity of a postcard to distribute to East Village residents regarding EVA and directing them to check out the website. The Winchester/Billy Loumbardias: Discussion was circulated regarding changes made to the previous proposal. Changes included more sound proofing, raised chimney, no PPA license at this time, exhaust system using ultraviolet filter and zoning change. Mr. Loumbardias is scheduled to return to EVA at next Membership Meeting for a vote on the zoning change. Scotte Rappe agreed to draft questions regarding the changes and the extent that the changes are being made. For example, the extent of the sound proofing or the location and actual height of the chimney. 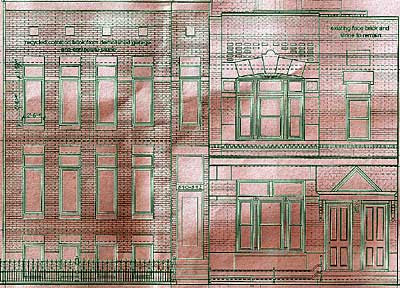 Ravi Ricker 840-842 N. Wolcott: A proposal for a new construction with an attachment to an existing building was reviewed. Landmarks is requesting EVA to review and comment to either oppose or approve of the proposal. Scotte Rappe agreed to draft a letter with EVA Board Members concerns with the project such as the reuse of the common brick from the garage, length of the setback for the new construction and number of windows on the front facade. Matt Bailey-greening of Augusta: John Scheer stated he spoke with Mr. Bailey who will discuss with the forestry department about the possibility of obtaining trees to plant along Augusta or other areas in East Village as a means to green the area. John Scheer agreed to continue communication with Mr. Bailey regarding the greening effort. Additional Communication regarding monthly membership meetings on the first Monday of the month: Dana Palmer has agreed to send an e-mail to all listed EVA members prior to the May Membership Meeting notifying them of the change from Tuesday to Monday and inviting them to attend. Agenda for May Membership Meeting: Billy Loumbardias with the Winchester Project. Ravi Ricker with the 840-842 N. Wolcott proposal. Stephen Rynkiewicz suggested the possibility of asking Jennie Felknor to speak regarding the work she does gardening and beautifying the East Village Neighborhood. Rich Anselmo agreed to try to line up a possible speaker for June regarding Liquor Licensing issues. Brian Thompson handed over gift certificates to John Scheer for Easy Bar. Idea was raised that gift certificates might be used as further incentives for new membership.